← Which got more cover on BBC News website this week – terror or ketchup? Obviously the corporation supposedly committed to editorial standards of accuracy and impartiality did not identify any problem in repeating the broadcast of such inaccuracies. Two months after the original interview took place, French experts ruled out the possibility of foul play in Arafat’s death. Last month – as the BBC itself reported – the French authorities closed the case. 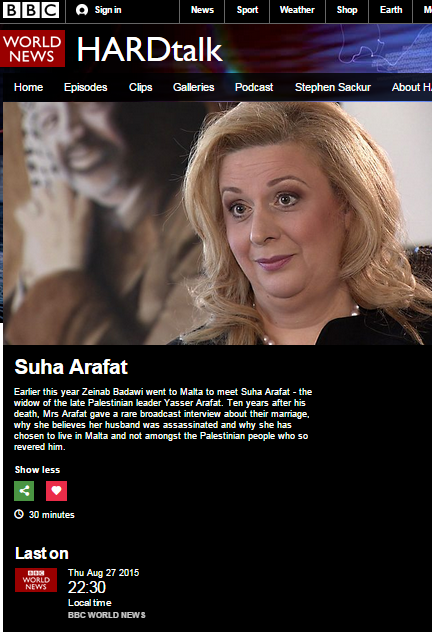 It would therefore be extremely interesting to gain some insight into the editorial considerations which led to this programme being repeated and BBC audiences being yet again exposed to amplification of a conspiracy theory which has already been shown to be a figment of Ms Arafat’s imagination.